As Microsoft is busy announcing its new partnerships with Intel and others to enhance its AI, VR, and AR presence, a Halo fan created a Cortana hologram. As Microsoft is putting its VR and AR plans to work, one Halo fan has created a Cortana hologram. Microsoft Build 17, which is held at the Washington State Convention Center, ended last Friday. At the conference dedicated to developers, the company announced new initiatives and partnerships. Microsoft revealed its aim to inject AI into all its products for everyday use, leveraging Cloud resources and the IoT to inform and improve upon its machine learning platform. Cortana is the face given to their proprietary AI platform. Last year, at Computex 16 in Taipei, Microsoft announced its Windows Holographic, a new platform that brings together VR and AR. The company unveiled its plans for the future where new formats of hardware would be powered with its flagship OS. Partnering with OEMs, ODMs and hardware manufacturers, the company, via Windows Holographic, seeks to develop mixed reality devices. To fend off Alexa and Google Home, Microsoft signed a partnership with Harman/Kardon and announced its first smart home speaker, Invoke, a Cortana-enabled device. In addition to Invoke, Microsoft also partnered with HP and Intel to develop future Cortana devices. HP would oversee the creation of hardware, while Intel provides a technical blueprint of the system. Microsoft also made Cortana Skills Kit available to the public. In other words, developers will be able to create and publish new skills for Cortana through Windows 10, Android, iOS, the new Invoke and any future Cortana-powered devices. Apart from official partnerships with major companies, Cortana’s most exciting development yet comes from a Halo gamer. Cortana, Microsoft’s AI voice assistant, was named after a female character in the video game Halo, following the request of the game’s many fans. 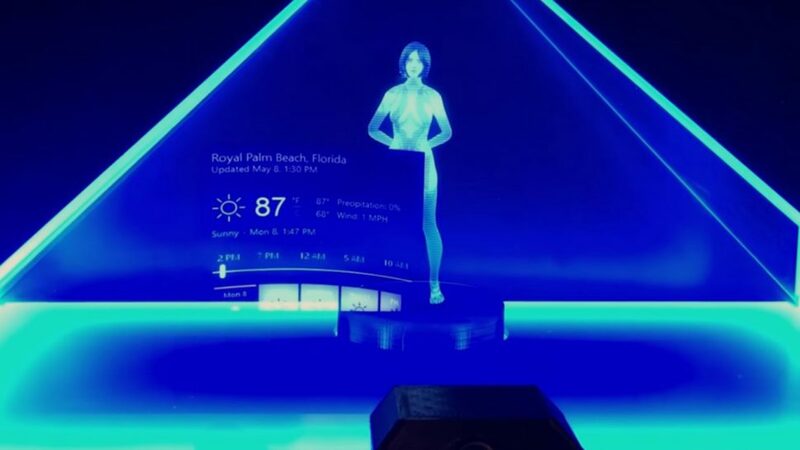 Now, a certain Jarem Archer has decided to give life to Cortana by transforming it into a holographic presence without losing any of its functionality. Archer is a developer and Halo fan and he didn’t wait until Microsoft thought of such a concept. He constructed a concept device, a glass pyramid, that lets Cortana be more than a disembodied voice. Using the 3D Unity app, Archer created Cortana animations by motion capture of the movements of his wife. Animations are then reflected on the four faces of the pyramid, giving the illusion of a 3D image visible from all sides. The device is equipped with a face tracking system, which allows it to direct Cortana, which is compatible with Windows 10, toward your direction.